Altamonte Springs, Florida, October 10, 2008—The world at its worst needs us at our best! That’s the message of IT’S GETTING BETTER—a DVD of hope. To give this message the widest possible audience, Star’s Edge International has released “It’s Getting Better” with subtitles in 14 languages. Asian languages include Japanese, Korean and Chinese. European languages include Dutch, German, Spanish, French, Italian, Portuguese and Hungarian. Nordic languages include Swedish and Icelandic. English and Hebrew complete the set. Harry Palmer, author of LIVING DELIBERATELY and the Avatar Course materials explains: "Our collective attitudes and beliefs shape the future as much as or more than events. " This is an idea that is experientially encountered on Palmer's Avatar Course, which promotes personal and social change through increased personal responsibility. Palmer's low key, often humorous presentation is welcome advice to a world waking up to the idea that our expectations do not have to be based solely on the past, but can also be based on our deliberate choices. 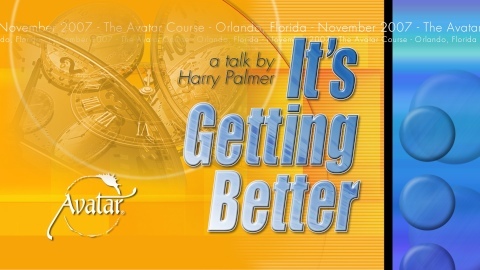 “It’s Getting Better” with subtitles is available through the online bookstore at TheAvatarBookstore.com. It’s also available for FREE preview online at AvatarEPCmedia.com.